The princess cut diamond, is a square cut but sometimes oblong and is known for the brilliant arrangement of facets like the ones found in emerald cut diamonds. However unlike emerald cut, princess cut shows off the sparkle and brilliance almost equivalent to or sometimes more than round diamonds. This cut was created after doing a survey to find out what women wanted in a diamond. Believed to have originated in the United States of America, this shape is one of the most favourite cut of diamond cutters and jewellers as nearly 80% of the original rough stone is conserved during the cutting process. As compared toother square cuts, princess cut comes closest to achieve the fire and brilliance of a round diamond, making it a perfect combination of opulence,sparkle, vivid appearance, unique shape, and great price value. Second most popular shape, princess cuts pare prices lower than round cuts. This achieves its incredible shine and sparkle because of the depth. This cut requires more weight to be directed toward the diamond's depth so as to maximize light’s performance. This is the reason why princess cut diamonds look smaller than round diamonds of the same weight. Depth of 70% to 78% is common for this cut. Ideal square ratio ranges from 1.00 to 1.05. Princess cut has 57 or 58 facets almost equivalent to that of a round cut. THE BEGINNING:The history of princess cut goes back to the 1960s even though it has gained popularity only in recent times. Second most popular cut today, it was originally a modification of another diamond cut, otherwise known as the “profile” cut, which was designed by Arpad Nagy, a London based diamond cutter, in 1961. The same name was carried forward and made popular by Ygal Perlman, Betzalel Ambar, and Israel Itzkowitz in Israel in 1979. 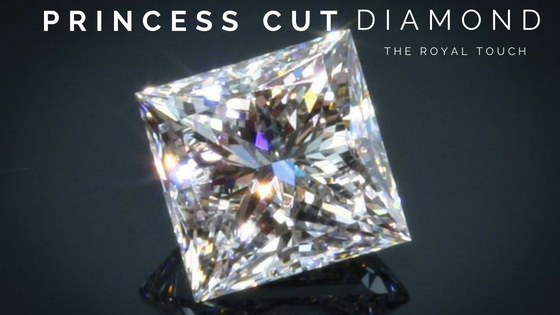 This later came to be known as the royal cut and then finally christened as the Princess Cut. POPULARITY:Also known as Square Modified Brilliant cut, a princess cut is the second most popular cut favoured by women around the globe for its regal look and fiery sparkle. Though ideally it has 58 facets similar to that of a round diamond, they can also have many smaller facets that can go up to 76 facets, making it shine brighter with maximum fire equivalent to or sometimes even more than round diamonds. The elegant and impressive look of a princess cut diamond makes it one of the best choice for crafting diamond engagement rings. This cut is most flattering to a hand with long fingers, most of the times it is accented with triangular stones at its sides. However, the versatile nature of a princess cut enables it to look equally ravishing in other jewelleries like pendants, anniversary bands, earrings. When searching for a more contemporary and classy style, consider this cut, with squared edges and fiery sparkle. It is shaped like an inverted pyramid with the flat side facing up.Because of the stunning brilliance, shine and fire of a princess cut diamond which is enhanced by its unique cutting and polishing technique, inclusions are less visible. A princess cut diamond should preferably be set in prong setting to protect the sharp four corners from chipping. Because of the unique shape of a princess cut which retains the most rough stone weight, some flaws such as naturals, extra facets, and other inclusions may be found near the corners and prong setting easily masks these flaws. RATIO: While considering a square shaped princess cut, a length-to-width ratio in between 1 and 1.05 is most recommended. However for those who would like the classy a rectangular shaped princess cut, should go for a ratio in between 1.07 to 1.15. The second most popular diamond, princess cut diamonds also likely to have a slightly lower price-per-carat than round cut diamonds. They are the most cost efficient diamonds for the diamond manufacturers. The squared inverted pyramid shape of the princess cut diamond is similar to one half of the octahedron rough stone from which it is cut. So from one rough diamondtwo princess cut diamonds are produced, lowering the cost of making drastically. A princess cut diamond preserves almost 80% of its carat weight. Superior efficiency or yield automatically translates to a lower price. A brilliance of princess cut diamond is because of its depth, meaning majority of its carat weight lies in the centre of the diamond rather than spreading out. This makes a princess cut diamond look visually smaller and hence affects the pricing a tad bit. - Since the weight of a princess cut lies in its depth it looks smaller, so it is recommended to go for a princess cut diamond with weight 1.00ct or more. This would have an excellent symmetry and well cut facets that flaunts the brilliance and fiery sparkle. - Since princess cut already has its own sparkle and fire that effectively hides the inclusions so a VVS1 to VS2 would fetch the best value. - While considering colour, G grade and higher without florescence are the best choice. The depth % of a diamond is calculated by dividing the depth by the width of the diamond. Following is the depth and table percentage as per the grading of the cut.